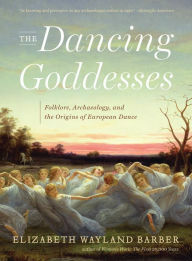 The Dancing Goddesses: Folklore, Archaeology, and the Origins of European Dance is a work of scholarship, but it is written with such clarity that general readers who already have some knowledge of paganism and folk dance should be able to understand it. This book was recommended to me while I was working on the Slavic Calendar Project, so I requested a review copy from the publisher, Norton. As I’d hoped, this book does help clarify which holidays on the Orthodox calendar have pagan rituals associated with them. If one wanted to actually perform dance rituals based on this book, one would have to recognize dances by their names in order to associate a specific dance with its ritual significance. For those who are already folk dancers, this book offers analysis and elucidation of a familiar dance, adding the author’s evaluation of its cultural and magical significance. Those who do not already know that dance could start with the name and find instruction elsewhere on how to perform it. Barber is both an archeologist and a folk dancer. In the first chapter, “Dancing As Life,” she tells how she glimpsed the Dancing Goddesses and pursued them. Dance is ritual. The author contends that dances had a place in the rituals for the turning of the wheel of the year, and that European folk dance began as magic to influence the flow of life. Barber summarizes the magical theory behind using ritual motions to encourage agricultural fertility. The dancing goddesses both create and restore life. Through their dance, they generate life and luck, which is abundance for the community. European pagans engaged in ancestor worship. The Dancing Goddesses were the unmarried women who had died without having children, thus, not having used their fertility. Villagers sought to entice them to use their fertility to help the village grow crops. Also, living maidens could act as dancing goddesses by dancing. Dancing brides brought fertility, beauty, and other gifts to those dancing with them during a wedding dance. Rusalkas are a type of Dancing Goddess. The chapter “Dancing the Year” starts with the version of the rusalka story in which the river maidens draw men to them in order to tickle them, not eat them, but more deadly tales are related later. The rusalkas’ fertility function is the explanation for why man-eating mermaids are still worshipped in Slavic countries. Dancing Goddess figures include the vila or willy, faeries, nixies, mermaids, mavka, nereid, nymph, et cetera. The author uses the term willy throughout the book as the generic term. She describes the traditional forms, dress, behavior, et cetera of willies, and the traditional ways people interacted with them, including warding them off and appeasing them. Many of the holidays in the “Dancing the Year” section are still being celebrated in their countries of origin, so their existence and some information on them is available on the net on native faith sites, on official government sites about national holidays, and on tour company sites. However, this book goes into much greater detail than what is generally available on the net, particularly with her examination of the magical theories behind certain customs, and linking modern customs to ancient origins. Barber relates a variety of holiday traditions and calendrical folkways, such as identifying a certain embroidery design as a calendar used by illiterate peasants. The author is a Rybakovian, as indicated by including Rybakov in the acknowledgments of this book. She tells Rybakov’s theory that the markings on certain clay pots are calendars, without noting that this theory is not universally accepted among academics. The author explains several folk customs, magic, and mythology as examples of the flawed thinking of premodern people. For example, she explains spring bird rituals as based on the logical error equating the return of birds at the same time that spring begins as the birds willing spring to return and being the cause of spring. The bird ritual is meant to entice the birds to will spring to return. There is a lot of information here of interest to someone studying comparative religion that would not be of interest to a reader who hoped for a history of dance. At first it seemed odd to me that the author located the Rusalia festival in the spring, since I knew from working on the Slavic Calendar Project that those countries that celebrate a Rusalka holiday celebrate it in the summer. As the chapter went on, though, I discovered that the author was using the terms spring rusalii, summer rusalii, et cetera to refer to the major holidays of the agricultural year, not just the specific holiday known as Rusalia. Barber contends that all of the holidays that take place in the growing and reaping seasons involve the Dancing Goddesses in some way, with the frozen winter holidays the province of male spirits. She does cover the summer holiday Rusalia Week when she gets to summer, taking the holidays in order from the first of the year. The author goes into a lot of detail about dance companies that perform ritual dances for fertility and healing during Rusalia Week. The cures are described in ways that are clearly shamanic. In Bulgaria and Romania there are different but related types of dance companies that perform both public rituals for luck and fertility and private healings to cure spiritual ills caused by angering the willies. These are male dance companies. There are also women’s dances, for example, a dance to beat clay with the feet for pottery. Either a ruchenitsa or a paidushko is danced for that pupose. In part two, the author leaves the topic of calendar customs and goes into fairy tales and weddings. The Frog Princess is a Dancing Goddess, of no particular name, who is a bride. Eggs are a goddess symbol, so both frogs and birds represent goddess as egg layer. In addition to fairy tales, Barber analyzes songs for marriage, preparation, and ceremony, objects related to weddings, et cetera. For example, there is a magical working done by embroidering specific designs on clothing. The author tracks down various motifs in the fairy tale “The Frog Princess” through other fairy tales in related cultures and speculates on lost customs remembered in these tales, particularly regarding the social functions of witches and wizards in pre-Christian times. This section is of great interest to pagans, but barely mentions dance. Barber contends that Baba Yaga and Kotschei are not evil, just misunderstood. Some European dance customs ultimately trace back to the sacred theater of pagan Greece. The horo or hora is a Greek chorus. The leader of a Greek line dance is the drama protagonist, acting a different set of steps than the chorus, which is the other dancers. The author traces elements of dance ritual back through ancient Greece to the civilizations that came before. She traces dance back to the dawn of agriculture, and posits that line and circle dances arose along with agriculture and the beginnings of permanent settlement on land. Dancing with joined hands was a social bonding ritual required by a population newly tied to the land and to neighbors. Barber traces dance back even farther, past the Neolithic beginnings of agriculture and on into the Paleolithic. Most of the information on Stone Age dance consists of pottery and speculation. In the final section, “Gotta Dance,” the author examines the human capacity for keeping time. She contends that the ability to use rhythm originated before the ability to use spoken language. Moving together bonds social groups together. What folk dance provides for a village of peasant farmers, marching in close order, drill provides for soldiers. Some folk dances teach military skills; for example, vari hasapiko teaches a small unit consisting of a four man team to follow a leader’s silent signals. This chapter includes a map of the distribution of rhythms and dance types in Europe, with couple dances in Catholic areas and line dances in Orthodox areas. Dance types are tied to the cultures which spread Christianity, with an older type found in the areas influenced by Byzantium, outward from the capitol of what is today Turkey, and the newer mixer and couple types in the areas influenced by Rome. Transition dances between the older line and circle types and the newer couple types include court dances such as the quadrille, and many English and Scottish country dances, with American square dancing occupying an evolutionary step in between English and Scottish country dances and modern couple dances. Folk dancing today is evolving toward shows rather than participatory ritual. This book gave me a greater appreciation for the folk dances that I already do. It renewed my enthusiasm for participating in preserving the world heritage of dance. I will use this book as a reference for my folk dance group. I will be consulting it again and again as I select dances for various occasions, and present the cultural context of specific dances. This book will have an honored place on my bookshelf. I highly recommend it for the advanced reader with an interest in paganism and folk dance.